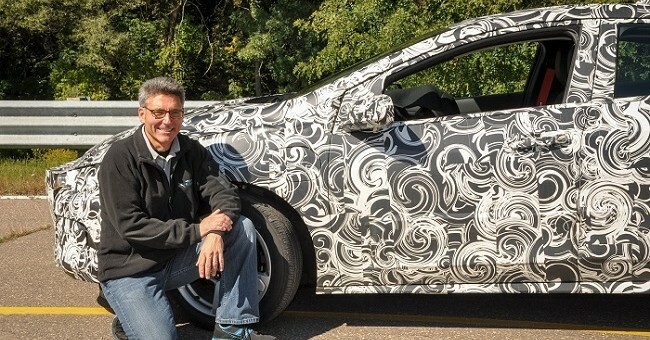 We’ve seen some photos of Chevrolet’s next-generation Volt extended-range EV undergoing pre-production testing and each time, it’s been wearing a special ‘swirly’ kind of camouflage to conceal its sleeker and more aerodynamic new body. This is a common practice among automotive engineers and today, Chevrolet is revealing the tricks of the trade behind camouflaging prototypes. The first thing to know is the camouflage is not made by designers, but rather engineers. Lionel Perkins is General Motors’ head camouflage engineer and is tasked with balancing the amount of camouflage on the prototypes with the engineering team’s interests. Black and white patterns are almost always used for prototype camouflage, as they create a shadow which can hide vehicle lines and design elements. The ‘swirly’ effect you also see often helps hide body lines. Engineers used to use a grid type pattern, but discovered it was hard to exactly realign the pattern when replacing pieces on the car. The swirls don’t need to line up properly and make it harder to distinguish individual body lines. Engineers also attach materials to the car to help throw off spy photographers and curious consumers. Camouflage can be made from plastic, vinyl, foam and GM’s personal favourite – bubble wrap. GM says bubble wrap is a lightweight, easily attachable three-dimensional material that can easily confuse any prying eyes. GM camouflage engineers began preparing the camouflage package for the 2016 Volt six months ahead of when pre-production testing started. They say they will keep updating the car’s camouflage to keep spy photographers and other curious onlookers curious and confused. Outside the car magazines, I wonder how many are really interested.